Building leadership to implement effective national health systems that provide health care for all. Upholding the right to health through implementation of effective health policies. Leadership to advance policy reform for increased access to equitable, quality health services. When MLI began over four years ago, those of us leading MLI had very few preconceived notions. We wanted to keep as open a mind as possible about how MLI could help developing countries follow through on their priorities for the health care of their people. Our initial thought going into the job was that we could help build leadership in health ministries. But we quickly realized that it wasn’t about building leadership-- dynamic leadership was very much present but sometimes swamped beneath the enormous pressures of huge jobs with little resources. MLI looked for ways to support ministry leaders’ efforts and to better position and promote their voices and their priorities to national and global audiences. And we gained an appreciation for the value of senior ministry leaders supporting, learning, and sharing with each other. The “Advancing Country Ownership for Greater Results: A Roundtable Dialogue” took place on January 12, 2012, and was hosted by the Ministerial Leadership Initiative for Global Health (MLI). 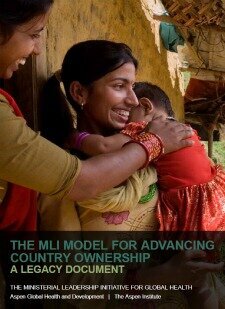 Country ownership is viewed as an important step towards improving aid effectiveness for global health. Yet, country ownership is a debated issue, particularly what it means in practical terms to donors, development partners, civil society, and country governments. The proceedings document the rich dialogue that occurred during the roundtable.